Yeah, there's no tennis ball in this picture...but tennis is involved. So Fridays are my busy day since I run kiddos to school, then I play tennis for an hour and a half, then I order sushi take out, then I pick up Miss Peach, then I pick up The Little Man...I'm basically running all day. I finally got everyone home...and Little Man says "Mommy...where's Smokey?" I checked all of his favorite sleeping spots...nuthin'. I grabbed my coat, fully prepared to tear through the sub zero streets screaming "SMOKEY!" at the top of my lungs, hoping that fat little cat would hear me and come running. Mr Smokey has been a bad boy three times since he moved to the city. Once, I found him, and twice someone called my cell # on his collar. 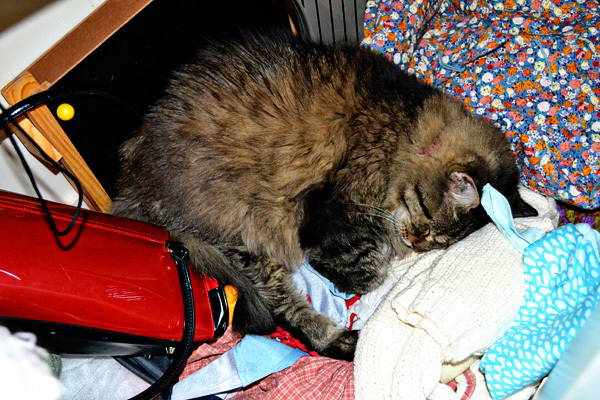 ...and there he was, all curled up in the closet where I keep the tennis balls. Thank. GOODNESS! *Miss Peach is a bit of a hoarder...don't you think? OMG, I feel your panic! The other two cats are finally full-grown enough to warrant collars with tags, but they haven't even shown any interest in leaving the house, like Jasper. My husband gets so furious with me when I'm in a panic over where Jasper is, I've wandered the neighborhood calling for him to find that he's locked in our bedroom armoir, the bathroom closet (of course he's sleeping on the towels), and the dryer (THE DRYER! He's lucky that I thought to look in there because he would have been in there for a looooooooong time).